New Oklahoma State coach Brad Underwood talks about transitioning to Big 12 basketball and Thomas Walkup's pro prospects. With the 2016 college basketball coaching carousel nearing its conclusion, SI.com is checking in with all the major hires about their new gigs. These Q&As will be posted periodically throughout April and May. 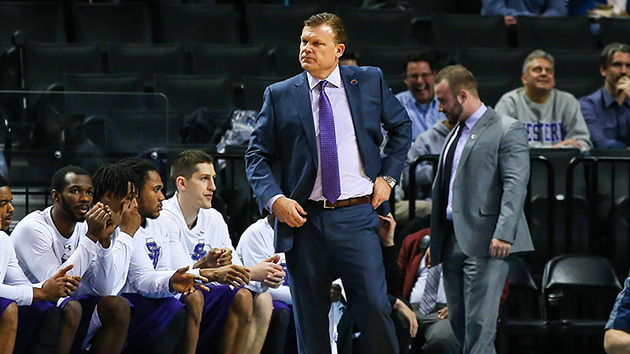 Next up is Brad Underwood, who spent three seasons as Stephen F. Austin’s head coach before leaving for the same post at Oklahoma State on March 21. Underwood, 52, led the Lumberjacks to an 89–14 record, a winning percentage of 86.4%, losing only one conference game in three years and appearing in three straight NCAA tournaments. He is married and has three children. This interview took place on April 27. Sports Illustrated: You have been considered for the past couple years to be one of the best mid-major coaches and a candidate to make the jump to any number of big-time jobs. What did Oklahoma State offer that made you want to leave for this job now? Brad Underwood: I don’t want to diminish the emphasis put on the team, but it’s much more about the program. I cut my teeth as a young boy watching the RayCom Phillips 66 Big Eight Saturday game of the week. And I watched these great coaches and players in these great venues, and I had great appreciation for it. As a kid you idolize those players and those coaches. Then as a player at Kansas State, I got to be a participant in those games and in those arenas. Then I came back as a coach at Kansas State and was able to live that again in a different capacity. The Big 12 was a big lure for me. The Oklahoma State job, I have tremendous appreciation for the culture, the tradition. I don’t take that lightly. We have extremely intelligent basketball fans here. When you throw the name Henry Iba out there, you throw the name Eddie Sutton out there, everybody knows greatness. That culture means a great deal to me. You don’t create tradition overnight. This has ready-made tradition. I feel very honored to be on Eddie Sutton Court and Gallagher-Iba Arena. It means a great deal to me. SI: Before we talk about Oklahoma State, I want to go back a little bit. You got into coaching pretty much right after your playing career at Kansas State ended. Did you always want to be a coach? BU: The truthful answer is no. I was probably more inclined to—as a player, I was an extremely competitive player. I wasn’t a great player, but I worked awfully hard. I had to work awfully hard to make it to the Big Eight level. When it ended, I knew it wasn’t a pro. For me, going to play basketball and having fun doing it was difficult. I needed to compete. I’d worked at it. I thought, well, I’ll go into the business world. And I actually took a job with a big insurance company. My father had been in the insurance business and had an agency, and I went to learn the business. After a few months, my hunger for basketball was eating away at me. I went back, and I left my job, and I went back to grad school at Hardin–Simmons [in Texas]. SI: You had a pretty winding and long journey to get to Stephen F. Austin, your first head job at a D-I program. You spent about seven years total as a community college coach and almost 20 years as a D-I assistant. Why do you think it took so much time for you to get a program of your own? BU: I can’t answer that. I don’t know why. I think the journey helped me a great deal. I think it helped prepare me. The one thing I’ve been very blessed with in my life is that I’ve been around really good coaches. That goes back to the high school level, where I had a Hall of Fame coach in the state of Kansas. I got to play for Jack Martin. To be with Jim Kerwin [at Western Illinois] for two years. To be with Bob Huggins [at Kansas State], Frank Martin [at South Carolina]. I’ve been very fortunate. All those coaches have one thing in common: They all won. I don’t know why it took so long. I’m not a guy who is a big self-promoter. I guess it’s my Midwestern values. I just kinda showed up and did my job and did it to the best of my abilities. I took a lot of pride in it. I didn’t want to be a head coach just to have the title. I wanted to be a head coach in a program that allowed you to win. And there’s not a lot of those jobs out there. So I was selective. Stephen F. Austin presented that opportunity, and I’m very grateful. The importance of winning, the importance of the culture of basketball there was terrific. I’ve said many times, when I walked in the interview, I wasn’t sure. When I walked out, I knew that I wanted it. It was the president, the board of regents, and the athletic director in that meeting. Those are the three most important people in a university, and there they were sitting in a basketball interview. That meant a great deal for me. SI: You took essentially no time to get to work winning. You took a program that had only been to one NCAA tournament, in 2009, and proceeded to make three NCAA tournaments and lose only one conference game. Were you expecting that kind of success right away? BU: Honestly, no. You go in and you know there’s a culture there. It takes so many people. I had a great staff. It’s not just about me. We had players who were willing to listen and buy into coaching, and we added great recruits. It was one of those situations that, early on, the first month on the job, was very unstable. I went from having two scholarships when I got the job, to a month later having seven scholarships available. You’re in complete flux. You don’t know what your team is going to look like, and here it is May. So there were a lot of people involved. And they deserve a lot of the credit as well. But it was a special place. We were able to do develop tremendous relationships, get great crowds there. We increased the season ticket base tenfold. We got off on a good path and we were able to create a well-oiled path that just kept growing. And the administration allowed us to keep growing. It’s a heck of a program. SI: One last question about Stephen F. Austin. 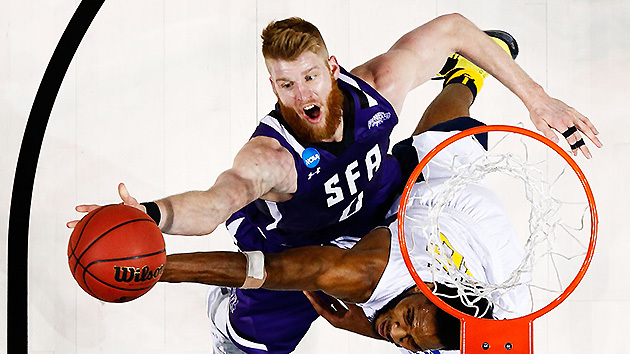 Thomas Walkup had about the most efficient season of the analytics era in for a high usage guy in college basketball. What can you say about him, and what do you think of his pro prospects? BU: Is that in all of college basketball, or in the school’s history? SI: All of college basketball. He used 27.3% of available possessions with a 134.0 offensive rating. The previous best mark was Noah Dahlman at Wofford with a 27.2% usage rate and a 130.2 offensive rating. BU: Here’s what I’ll say about Tom: There’s unbelievable value in high character. And he’s at the top of that list. He is a self-made player—and I say self-made: There’s a lot of work by our coaches and Tom didn’t do it by himself. What Tom did was commit to work. He was a player that was lightly recruited out of high school. He was a player that averaged 4.4 points a game as a freshman. He transformed himself physically in the weight room and by doing that, gave himself versatility that allowed him to play defensively at different positions. Offensively, he was a 60.5% free-throw shooter as a freshman—just horrendous—and probably a worse three-point shooter. He was basically a high school power forward/center. But his best skills were at the point. And he continued to hone his weaknesses and make them strengths. He continued to work on shooting the basketball. Here’s a guy who goes 19 for 20 in an NCAA tournament game against West Virginia. And that says a lot about the individual. ​Is he a pro? Absolutely he’s a pro. I look at some of these guys who are in the NBA. Not only is he a talented guy because he’s a very deceptive athlete, but he’s also the highest IQ player I’ve ever coached. He is the best teammate that you could possibly ask for. He’s going to do nothing but continue to improve his game at the next level because of his work. He’s a young man who has improved since the season has been over because all he’s done is work out. He played great in [the] Portsmouth [Invitational Tournament]. It was great for him to be in that scenario because he got to play more point guard than he did with us. I don’t have enough superlatives and adjectives to talk about Tom. His efficiency was something well noted on our end. He’s 6’4”, 6’5” and he’s the school’s alltime leading rebounder. Probably the greatest thing I can say about Tom is—and it’s no coincidence that his teams won championships—all Tom’s teams in pickup games win. Tom is the winningest player in the history of Stephen F. Austin. He’s the winningest player in the history of the Southland conference. He’s a winner. And there are just some people that have it, and I don’t know how you describe it, but he has it. All he does is win, and he affects people around him, and he makes people better around him. Man, he’s a unique player from that capacity. SI: He plays with just an unbelievable amount of confidence. BU: And he’s earned that right to have that confidence because he’s worked so hard. He’s a unique guy in that he’s never afraid of the moment. He’s just a guy that has worked his way and taken coaching and developed all of that and put it into a package that’s made him great. Some NBA team is going to be really lucky. I don’t know if it’ll be his rookie year. I don’t know when that’ll be. But they’re going to get a really good player. And they’re going to win championships, and he’s going to be a part of it. SI: Moving to Oklahoma State, you’re going to a job where expectations are extremely high and the margin for error seems to be slim. How do you handle a transition like that? BU: I wouldn’t have come here if they weren’t high, to be very honest. There’s nobody—or no program—that values winning more than I do individually. I think there’s tremendous responsibility in that. I use the term “Dream Big” a lot. It’s what I do. We tell our players: Losing is not an option. We have to set a culture and a precedent in our locker room and with our players and with everyone who surrounds our program with that: Losing is not an option. The expectations, I don’t worry one second about those because they’re not near as high as what I have for myself and our program. I wouldn’t have come here if it were any different because winning is that important to me. This is a great job, and it’s in a great conference, but that winning culture is why I wanted to be here. SI: You now have a lot more to offer recruits, but also a lot more competition for the type of recruits you want. How has recruiting gone so far, and what’s the plan for getting the right players to Oklahoma State? BU: I think kids are the same. I think the thing that we understand is that we have to get guys who are dialed in as pros and have the ability to be pros. That’s what this league has. You can go down the line with every single team in this league. It also has arguably the best set of coaches in any conference in America. That in itself is an easy sell. Oklahoma State and the tradition and the culture have been received tremendously. Are we playing catch up? Sure, just like Jamie Dixon at TCU and just like Chris Beard at Texas Tech. And it’s just like Kevin Stallings at Pitt—all the guys who have gotten jobs are playing catch up because the dynamics of the program shift a little bit when there’s a change. The pieces of the puzzle become a little different. What Oklahoma State did here in the past may be different from what we want to do now. So the recruiting piece is changing. You’re playing catch up. We had a roster that was fairly set. You know, it’s going to have minor changes but not many. There were some positives in that standpoint. But the recruiting aspect of it is something in which we are catching up, but it’s been extremely well received. We’re on different kids than we were at Stephen F. Austin, so we’re trying to let them know what we’re about and what our program is about. We’ve made a lot of progress in the past month. SI: Finally, you’re known as a pretty intense and driven guy. Do you have any off the court hobby or leisure activities that would surprise people? BU: Well I love to play golf. I grew up playing. I’ve literally lived in a torture chamber the month I’ve been here because I’m staying at Karsten Creek [Golf Club], which is one of the elite golf courses here. It’s an incredibly beautiful setting, and I have not played. Every morning I leave, and I see the deer running and the turkeys, and it’s painful. Most people get stressed when they play golf, but I don’t. I can’t imagine there’s going to be a whole lot of golf. Only a round here or there as we get this thing going. I have high-school-aged daughters, I have a son who’s in college—it’s a challenging time of year for my family. This year will probably be quite a bit of family time. I’ve seen them one time since the press conference a month ago. We have some catching up to do. We’ll try to spend three or four days here down the line with just family and try to make the transition a little bit easier. SI: Anything else in closing? BU: I do want to say this. You talked about my lengthy journey to SFA. I think the one thing that’s come with experience for me is that I never fight my gut. My gut told me that SFA was right, and I was fortunate that SFA selected me. I had other options this year, but I knew right away that this was right. To me, that’s more important than a dollar value or anything else—a gut feeling that something is right. My wife said it 12 hours after we were here in town. She said: This just feels like home. That puts a big smile on your face when your wife says that. I know it’s right and that’s something I feel very confident about. Who were the nation's top prospects this spring?